On May 12, 1919, the Michigan Legislature established the Michigan State Park Commission, paving the way for Michigan's state parks system. Fast forward to today and Michigan is home to 103 state parks, as well as the many campgrounds, boat launches, swimming beaches, fishing piers, trails and lighthouses found in those parks. The centennial is a nod to our rich history and an energizing look forward, and we're marking this milestone year with special events, podcasts, historical stories, videos, geocaching and lots more. Campers and day-trippers, if you’re as excited as we are about this once-in-a-century celebration, why not camp with us around the May 12 anniversary date of Michigan state parks? Or pack a picnic lunch, grab your hiking shoes, bike or paddle and spend a day exploring. The official 100-year anniversary will fall on the weekend of May 10-12, which means that the six-month window to make camping reservations for that weekend opens tomorrow. Plus, all camping parties will receive a complimentary commemorative bumper sticker upon arrival. Pick your favorite park or one that’s new to you! Make camping reservations on the revamped reservation website at midnrreservations.com or call 800-447-2757. Explore the online reservation website's new look! 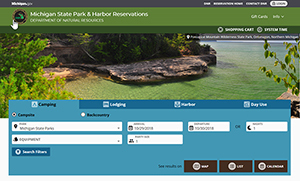 As we prepare for the 2019 centennial celebration, we are excited to share the DNR's updated online reservations website for Michigan state parks and harbors at midnrreservations.com. The website has a new look and feel, simpler navigation, a more mobile-friendly design, and colors that better reflect those you see on the DNR website and many of our other materials. Much of the functionality that customers have come to know was carried over. 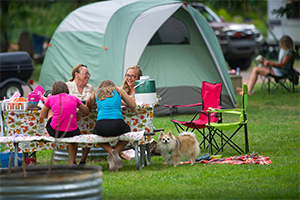 Campers can still search for campsites and harbor slips from a map, list or calendar display and view photos of campsites located in each campground. 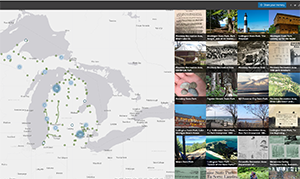 To help capture the stories of this centennial outdoors legacy, we've launched a digital Michigan State Parks Photo Story Map, a virtual guest book of sorts where visitors and staff – the heart of Michigan state parks – can share special stories, memories and photos. Visit the story map at michigan.gov/stateparks100. You can sign in as a guest, so no login is required. Add your photo and story! Bookmark this page so you can add your memories all year!